Our issue-based strategies provide community partners with a steady stream of reliable, trained, and well supported students taking on direct service volunteer roles, and then building up to take on capacity-building opportunities at their agencies. Site- or issue-based teams are the foundational structure on campuses to organize student engagement. Whether a student club or organization or part of the more intensive Bonner Program, these teams recruit, train, and manage student volunteers for one-time and weekly service commitments. We are initiating a new partnership with the Congressional Hunger Center to bring their expertise, leadership, and networking resources to our network (see below and here for more details). Students are prepared for their service, community partner and campus staff educate and train students in workshops on site and on campus, while faculty provide additional skill and educational preparation and support through service-learning and community-based research courses. Bonner service role progresses over four years. Clic to enlarge. After a period of exploring various options, many Bonners settle on an issue or even a community partner that they remain with for the duration of their four years in the program. One of our goals is that their roles evolve of this time from direct service placements to service leadership coordinating other student volunteers, and then to conducting community-identified capacity-building projects and even social action. Specific learning outcomes help guide this developmental process. As community and civic engagement centers, courses, and programs have grown in importance on campuses across the country, the need for deep, place-based, and developmental community partnerships have become critical to the educational and service mission of higher education institutions. Developing and sustaining these partnerships is a central purpose of the campus-wide center(s) for civic and community engagement. Increasingly once or twice a year campuses are convening community partners that work on similar issues to discuss their common challenges and opportunities to engage students and faculty teams in both single organization and collaborative projects. One outcome we hope to see from these discussions are multi-phase project opportunities that will allow successive teams of students to contribute to making long-term organizational and community change. These sustained issue-focused partnerships are helping inspire community-engaged academic pathways that take the form of concentrations or minors and that culminate in community-engaged capstones (also known as “signature work”). There are opportunities to link individual, issue-focused community-campus partnerships nationally within the Bonner Network and with regional and national issue-focused organizations. These partnerships have the potential to increase the quality and sources of issue-based education, training, and program development, with the national organizations leveraging their expertise and networks in helping support participating campuses and local partners. These national partnerships also lend themselves to forming issue-based summer internship cohorts that can further the development of student knowledge and skills, and lead to career opportunities for students have they graduate. Issue-based pathways culminating in a community-identified capstone-project allows students and campuses to provide much higher levels of capacity-building support for community partners. By definition, a capstone project is the highest level of service a student could provide. Our hope is that having defined pathways leading to capstone projects in the senior year (and often project-based service in the junior or even sophomore year for some students) will provide community partners with a steady stream of reliable, trained, and well supported student interns taking on critical capacity-building opportunities at their agencies. 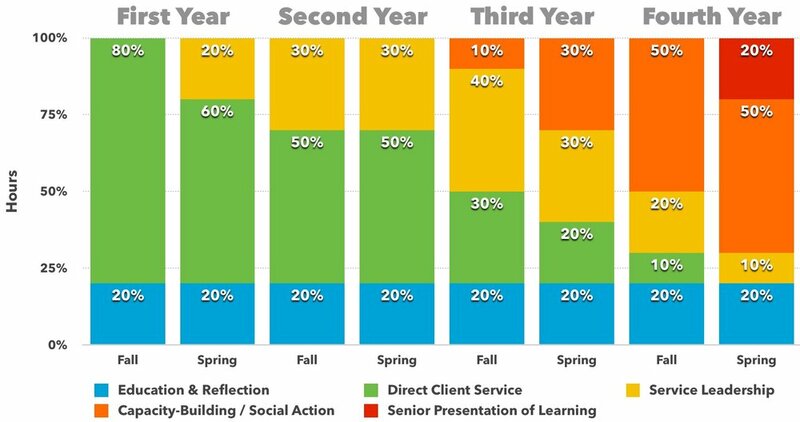 At the same time, defining pathways that integrate student coursework, service internships, and capstone projects offers a clearer way to link the disparate and disconnected community engagement efforts on campuses big and small. Some students will want to go deep on a particular issue, learning everything they can and trying different ways to engage on that issue over their college career. These students will gravitate towards the issue-based pathways, which are usually offered in the form of academic concentrations that combine coursework from multiple disciplines related to the issue. Other students won’t care so much about a specific issue but want to hone their competencies in a specific area: policy research, non-profit management, communications, community development, volunteer management and leadership. These pathways are taking the form of fellowships or certificates and are offered by specific departments (though that might necessarily be the case over time for some of the skill areas, such as research). We have begun a multi-part initiative with the Congressional Hunger Center which represents our first issue-based national partnership. CHC Zero Hunger Academy — a series of four online learning modules focused on hunger and poverty issues in the U.S. and their root causes. CHC Zero Hunger Campus Network — for campuses that want to deepen their focus around food security and hunger, and be exposed to advocacy opportunities. Campuses will begin this process by attending the Zero Hunger Academy and launching a local Zero Hunger Community Report, which will be shared via the PolicyOptions Wiki in the form of a series of issue briefs and directory of organizations and information sources. CHC Zero Hunger Summer 2018 Internship Program — this cohort internship program that will help a select number of students across the Bonner network engage more intentionally in advocacy and education activities at the local, state, and federal level. You can read more about this partnership here. We are hopeful that this initiative will provide a model upon which we can develop other issue-based national partnerships. We are also working with campuses on strategies for students to conduct policy research on issues they are confronting in their service placements and projects, and sharing this research on the PolicyOptions Wiki. We begun to compile issue-based resources on the Bonner Resource Wiki related hunger and college access. We anticipate adding additional resources to these and other issue areas as we move forward. Additional public policy research on a wide variety of issues can be found on the PolicyOptions wiki. We also have a variety of campus models for issue- and competency-based academic pathways on the Bonner Resource Wiki.